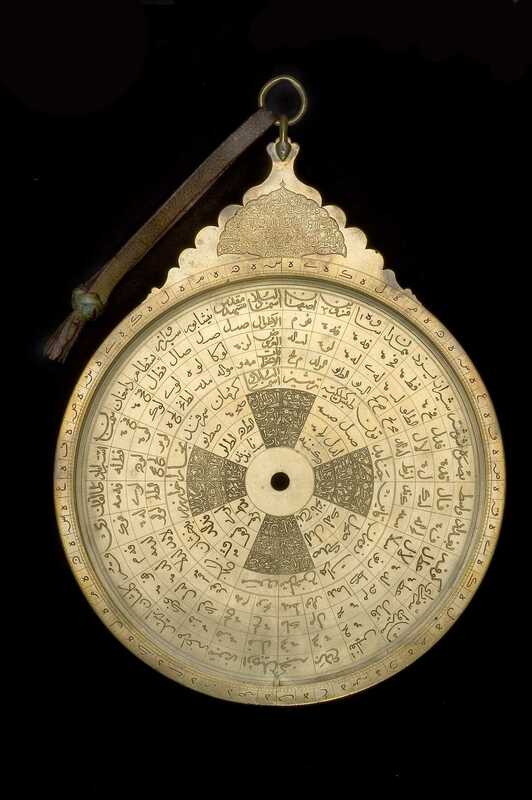 This lavish astrolabe was made for the Safavid ruler Shah Abbas II. He is described on the front as 'The supreme prince, the sultan, the most just, the most great, lord of the centres of command, remover of the causes of tyranny and rebellion, king of the kings of the age', while the back expresses the wish that 'May God Almighty perpetuate his Kingdom and his Empire and cause his justice and his benefits to spread over the worlds while the spheres revolve and the planets continue their courses.' These inscriptions appear on the throne at the top of the astrolabe. The sultan also had his name worked into the elaborate tracery of the rete. Altitude 0 - 90, Degrees of arc Every 5 degrees Circular, concentric The entire outer circle on the back of an astrolabe. Cotangent 0 - 40, 1/60 of quadrant radius Every 5 Circular, concentric Lower left quadrant of outer circular on back of instrument. Cotangent 0 - 45, 1/60 of quadrant radius Every 5 Circular, concentric Lower right quadrant of outer circular on back of instrument. The rete contains 47 stars. The rete contains zoomorphs: the star pointer for vega is shaped like a bird facing to the left The zodiac on the rete is labelled: الحمل , الثور , الجوزا , الشرطان , الاسد , السنبله , الميزان , العقرب , القوس , الجدى , الدلو , الحوت .The rete is inscribed with a owner's mark marked as: سلطا شاة عباس ثاني (Sultan Shah Abbas the Second). The inscription is worked into the tracery within the eclpitic on the rete. The 'skeletal' rotating disc on the front of most planispheric astrolabes. It usually consists of the circle of the ecliptic, the tropic of cancer and the tropic of capricon, and contains pointers for major stars. There are 5 plates with latitudes ranging from 22°0' to 42°0' . "O he who has (ya man lahu) the .... (? )", "O he who has the power, and praise be to (him)," and "O he who has the dominion, and praise be (to him)." The outer scale of the limbus is divided into labelled 5° intervals but not further subdivided. The rim is engraved with the famous Throne Verse from the Qur'an. The rete is a later replacement. There are four plates, with astrolabic markings for latitudes 22°, 30°, 32°, 34°, 35°, 36°, and a set of horizons. Those for 32° and 22° would serve Isfahan and Mecca. The altitude circles are for each 3° and the azimuth circles are for each 9° (unusual, but attested elsewhere). On some plates, markings are given for the hours after sunset and before sunrise in addition to the standard seasonal hours. The mater is engraved with a gazetteer arranged in a spiral with 30 sets of entries for 29 localities, the top sector being labelled "directions (abbreviations corresponding to the four quadrants of the horizon), localities, longitudes, latitudes and qiblas (inhirafat). 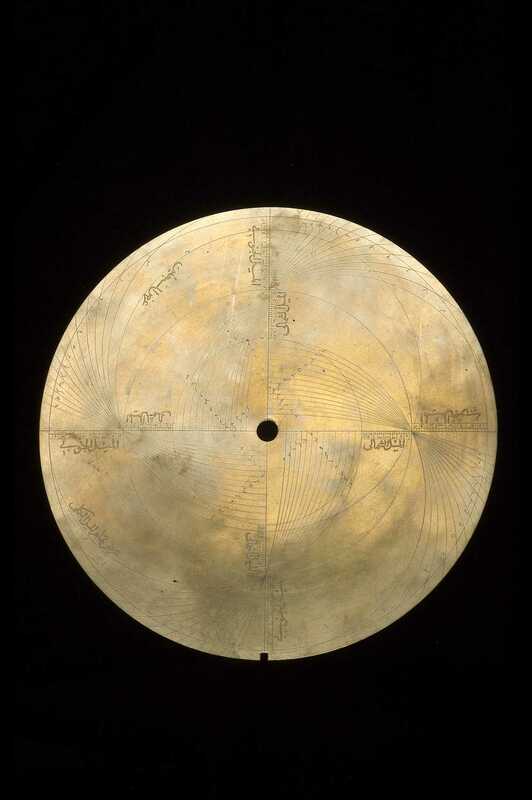 The data is standard for Isfahan astrolabes. The back is typical of the Safavid productions. The outer scale is divided and labelled for each 5° and subdivided for each 1°. In the upper left there is a trigonometric quadrant with horizontal parallels for each 1° and superposed on this are the markings for a universal horary quadrant. 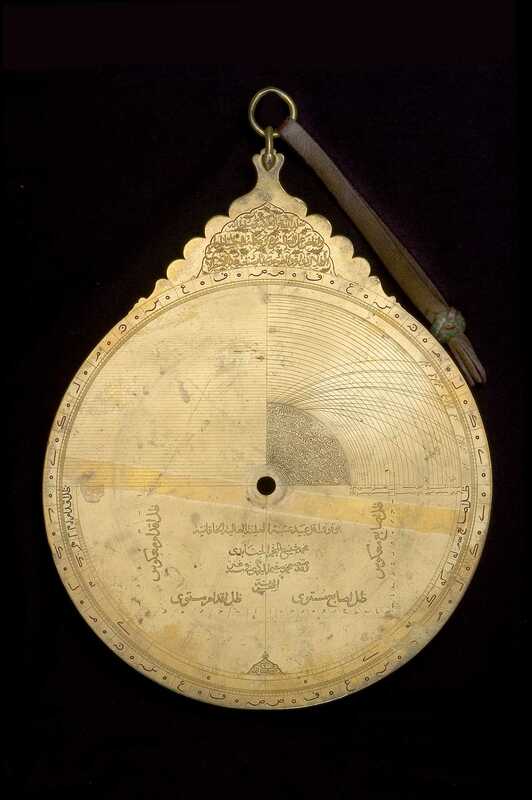 In the upper right is a solar quadrant with curves displaying graphically the altitudes of the sun at midday for a series of latitudes and the altitudes of the sun when it is in azimuth of the qibla at a series of cities, including Kufa, Baghdad, Isfahan and Tus. Below the horizontal diameter are scales and tables displaying standard astrological information. Below a double shadow square to bases 7 and 12 there is a cartouche bearing an inscription: "Made by Muhammad Mahdi al-Khadim al-Yazdi."